Spring asparagus is a real cause for excitement. It needs little more than eggs, bread and cheese to turn it into a super-star meal. 1. Heat ½ tbsp oil in a large frying pan set over a medium heat; add the breadcrumbs and fry, continually turning, until golden. Stir in the thyme, then tip into a bowl and allow to cool completely before adding the cheese. Season and set aside. 2. Wipe the pan with kitchen paper. Take 2 coffee cups and crack an egg into each, then add an extra yolk to each cup. Heat the remaining 1 tbsp oil in the pan and fry the eggs. After 1 minute, add the butter and baste until the tops of the yolks are set; season. Note: Semi-cooked eggs are not suitable for pregnant women, elderly people, or those with weak immune systems. 3. Meanwhile, plunge the asparagus into a large pan of boiling, salted water and simmer for 2 minutes (for medium-thickness spears); drain. 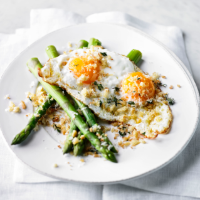 To serve, place 5 asparagus spears on each plate, top with a fried egg and sprinkle over the crumbs.